Would you like more traffic to your blog, plus more links and more comments? How about a chance to network online around the business mum community? It’s free and will take you just a couple of minutes. 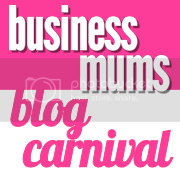 Then you need to enter the Business Mums Blog Carnival! If you’d like a reminder to enter the carnival every month, keep an eye on my Twitter feed or Facebook page. Even better, retweet my carnival tweets, share the carnival with your Facebook friends and blog about it. If we all spread the word, we’ll get more entries and more visitors to our blogs. Why no sales pitches? The aim of the blog carnival is for new readers to discover our blogs and then become regular visitors. For this to happen, the content needs to add value to the reader in some way, for example to be interesting, useful or entertaining. Posts that are basically sales pitches or press releases aren’t going to add any value – the chances are readers will read the first couple of lines of the post, realise what it is and not return. Here’s what you need to do to host the blog carnival. There are four colours to choose from, just pick the one you like and use the copy and paste code below to place it on your site! ..or go all out with the big pink badge from the top of this page! love the idea of a blog carnival to increase exposure of my little blog. Thank you so much for coming up with the idea and putting in action! !